If you’re a fan of adventure, Pittsburgh is the place to be. With three rivers in the downtown area as well as numerous state parks in the surrounding countryside, you’ll never have a lack of physically challenging activities to keep you busy. Be sure to add the following experiences to your list of things to do when vacationing in this city. The Allegheny, Ohio, and Monongahela Rivers meet at a confluence at Point State Park in downtown Pittsburgh. While it’s a beautiful sight to behold, it’s also a fun one to explore. 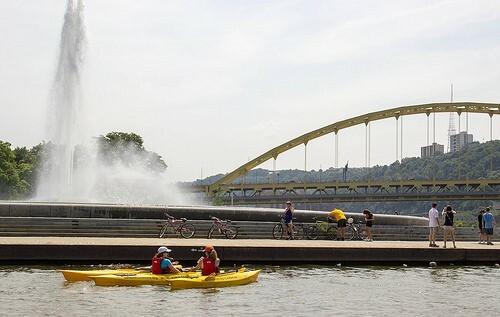 Get out on the water by renting a kayak at Kayak Pittsburgh on the North Shore. In your telltale yellow boat, you’ll be able to glide next to the Riverfront Trail to see both PNC Park and Heinz Field from the rivers. Head over to Station Square to dock and grab a bite to eat, or paddle down the Allegheny to check out Washington’s Landing. Pittsburgh is lucky to be a stop on the Great Allegheny Passage (GAP), a trail that starts at Point State Park and connects to the C&O Canal Towpath in Cumberland, Maryland, for a continuous path all the way to Washington, D.C. The 150-mile GAP prides itself in being nearly level at most points, with an average grade of less than 1 percent. Because the whole trail is made of crushed limestone, it’s perfect for walking, biking, or jogging for as long as you feel like going. Ohiopyle State Park is a little over an hour drive from Pittsburgh; however, it’s well worth the trip thanks to one unique feature — natural water slides. The park encompasses land in the Laurel Ridge, which includes rocky terrain. Over time, a shoot of the Youghiogheny River carved a path through these rocky gorges, creating a smooth natural slide that carries riders downhill. Swimmers can slide about 100 feet into a shallow pool. Just make sure the water levels aren’t too low or high, or you could end up getting stuck or being carried away by the current. 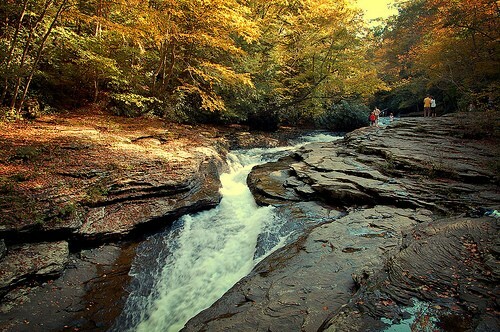 Since Ohiopyle State Park has myriad more opportunities to explore, considering booking your hotel close to this area. Check out Pittsburgh hotels on Hotel Planner to find a place that’s between the hustle and bustle of the city and the relaxing atmosphere of the country. Feel like zooming through the forest on a motorized vehicle? Then the Mines and Meadows ATV Park in Wampum is just the place for you. Just 45 minutes outside the city, this park has a twist— it was built on the site of former underground limestone mines. This means that you can take your journey underground to zoom around the abandoned caves and paths. Splash through underground lakes in near darkness for an experience that will get your heart beating. Pittsburgh is any adventurer’s dream city. Whether you are alone or in a group and crave stimulating experiences downtown or thrilling journeys in the country, Pittsburgh can appease your needs.